My visit to Chennai was super cool although the reason for which i went didn’t come up the way i want. But all i can say is hard luck and i will never loose hope! I am so disheartened but i think we all face many failure in our respective life to learn from them and grow more nicely as a person. So be a positive person, cheer up and get inspiration through these failures! Sharing one such inspirational story and my experience to a very unique and different restaurant in Chennai. This time i have put my hands to show you guys about India’s only dark restaurant and my experience of it which is in Chennai’s ‘Express Avenue’ mall. The place deserve a huge round of applause. It is a whole different journey of your mind which you can experience just because of the great efforts of blind or partially defected people. Yes, you read it right, it is opened up by some great people who don’t want our sympathy but are doing extraordinary great which we cannot even think of. You will actually get stunned by visiting this decent place. Talking about the inner’s of the place, imagine when you have to eat your food in dark? Just think it is all more than 100 percent darker inside and you are asked to have your food? This place is all about this. 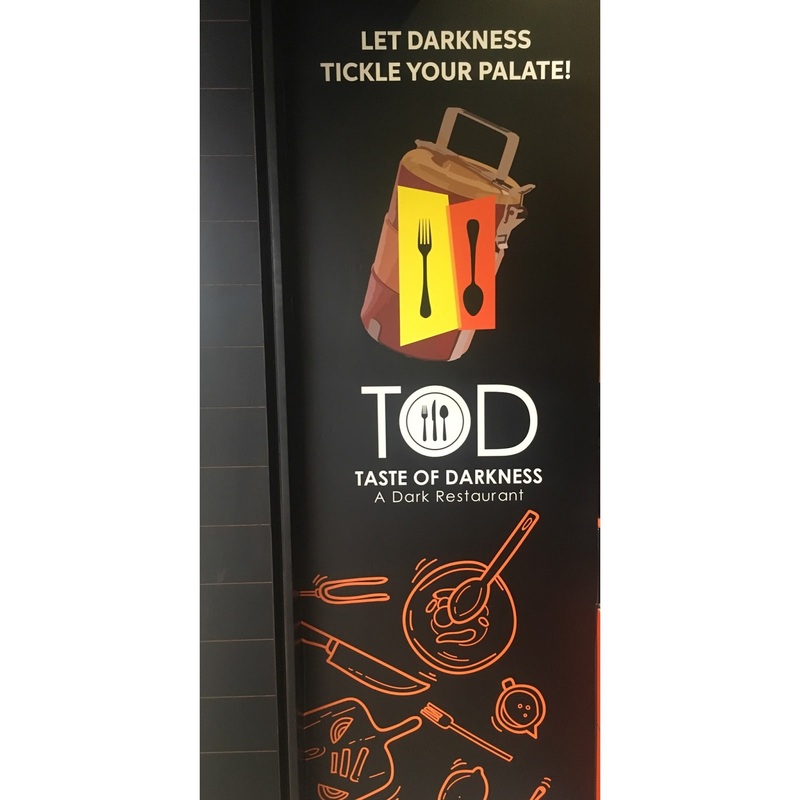 You are asked to have your meal in dark where there is no scope of even a pinch of light. I was not allowed to take the camera inside the restaurant and even if i was allowed it’s of no use because the place was all dark. So, here is the outside video and stils of this place. This is the door from where you will enter a darkest restaurant. You are provided with a token to go inside this place. There are token of two different colors depicting your choice of vegetarian or non-vegetarian food. There menu is fixed for each day so you cannot opt for food of your own choice but believe me whatever they will provide it will be great and it will deliver as a great experience to you. Furthermore, the price is also fixed at Rs 349/-. You can see that sticks are also there as inside no one can see anything so if you want it you can take it with yourself and you can move it here and there to feel how far things are from you. This is helpful for blinds and partially defected people who are there so that they can make their move easily. Then there are lockers where you have to keep your mobile’s, camera’s and other electronic items as they are not allowed inside. The machine which you can see is the key to enter inside. A person from outside will help you enter the door through his password so that you can go in and then you have to give the token to the people who are inside the restaurant so that they can help you by taking you to your table and sit and enjoy the whole new essence by being in dark. And he is the person who is available at the front to help you, guide you and tell you about this unique awesome place. If you focus even he has a defect in his left eye but the determination, courage, confidence and idea of these people is so strong that i believe soon dozens of these restaurants will open up in different states and everyone will love to spent their time in such inspiring places. The moment i entered inside, i cannot see anything. The place get dark and darker as i was going inside. My only sense which became strong was ears. I heard a lot of voices and sounds. I could hear the chirruping of birds also. Yes, i was frightened for some seconds but then it starting becoming alright. I became comfortable being there. I opted for vegetarian food so i can feel that i was eating some sort of cheese, spring rolls, dal there.Besides, I was feeling the aroma of food very strongly emphasizing that my other senses except eyes have become very strong at that time. I went with my sister there so we were talking. A happening talk, deep talks which actually made our sister’s bond strong. I was feeling more close to myself and at that time i realized the actual importance of this awesome place. If get a chance will go there again. I just loved it and the taste of food was also very nice so no need to worry. Your taste buds will also feel happy by going in there. A must go place seriously. Those who visit Chennai do go there! I have heard that a similar place is in Hyderabad “Inorbit Mall”, Hitec City as well. So you can visit such an inspiring place either in Chennai or Hyderabad. This time my life note revolves around being strong and fulfilling your dreams through hard work. Never lose hope because nothing is impossible. Just keep on trying harder and harder to achieve your dreams. Take inspirations through people and don’t be jealous of them please. It’s important to take inspiration and try to develop good qualities in yourself because each day is a new day to learn something new and move ahead in your life.